Our breakthrough serum revitalizes the skin’s appearance, restoring and maintaining its youthful vibrancy. DermaStem’s® all-natural ingredients hold the ideal environment for the natural skin renewal process. The very best ingredients, either certified organic or wild-harvested, are blended with innovative processing to preserve each ingredient's delicate essence. DermaStem contains absolutely nothing artificial. It is an emulsion of dozens of ingredients gathered from around the world, that work individually and in concert to regenerate the skin, while also fighting the effects of oxidative stress and other harmful internal and external triggers that cause premature ageing of the skin. Cold processing preserves the very fabric of each plant for unprecedented effect. No mineral oils, preservatives, or petro-chemicals are part of either the formula or the processing. Our clinical results demonstrate that dramatic and visible improvements occur rapidly with only a twice-daily application of DermaStem. This revolutionary product works to reduce the signs of premature ageing. Dozens of organic or wild-harvested plants with individual properties to fight the signs of premature ageing have been assembled from around the world. The DermaStem formula is the result of generations of proven results, all tested in the laboratory. Plant extracts are obtained using a cold infusion process. The delicate essences of all plants are preserved. Each anti-ageing ingredient is delivered in its most powerful, effective form for greatest benefits. Exclusive to DermaStem: RejuvHyal™, a proprietary form of glucosamine for a smoother, younger-looking appearance. Your face appears more radiant. 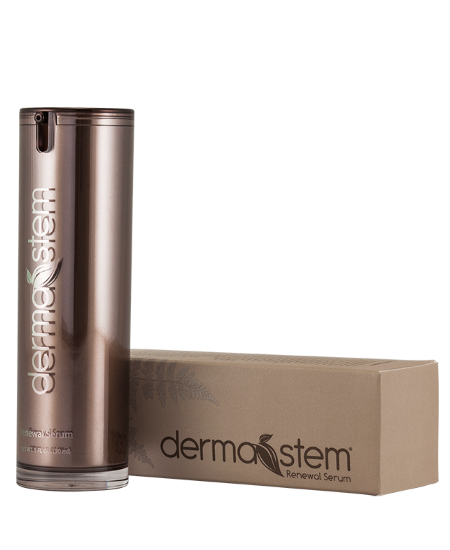 Exclusive to DermaStem: A blend of six Cytokines that stimulate the proliferation and migration of inner potential. Outer vibrancy comes from renewal and rejuvenation of the surface of the skin, producing a more youthful appearance. Outer vibrancy comes from renewal and rejuvenation of the surface of the skin, producing a more youthful appearance. The blend of all these features gives a product second to none, which was shown in clinical trials to reduce wrinkles by 25%, increase elasticity by 10% and increase moisture by 30% in 28 days!